Climb aboard and hear the whistle blow! The Cuyahoga Valley Scenic Railroad offers excursions year round and offers an excellent view of the natural scenery and wildlife of the national park and an opportunity to learn about the history of the railroad in valley. Whether you are looking for a family trip or a special celebration, the Cuyahoga Valley Scenic Railroad has something for everyone. 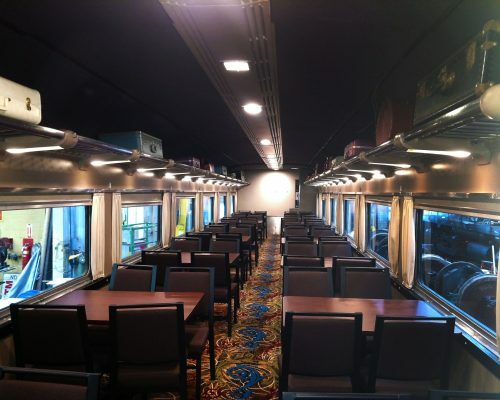 The recently remodeled Saint Lucie Sound lounge car can accommodate a private bar, and catering services. A modestly-sized table can be set up inside this car for dining, conferences, and meetings. Additional accommodations in the St. Lucie include: complimentary Wi-Fi, private bathroom, and easily accessible outlets for electronic use and a drop presentation screen. 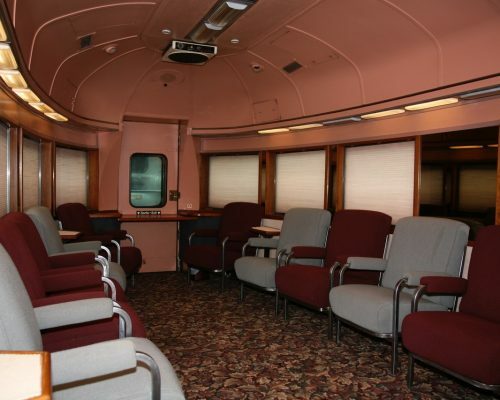 The First-Class Car houses both our first class and Upper Dome sections. 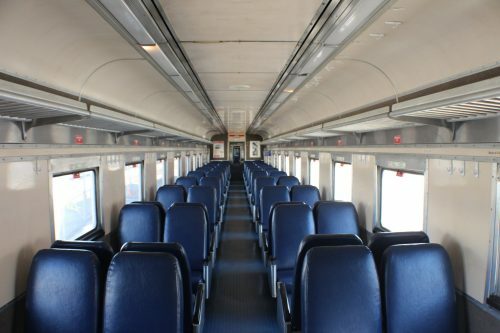 On the lower level, First Class (40 seats) offers comfortable seating with additional leg room, and tables between seats. Upstairs, the Dome section (20 seats) offers a panoramic view of the park. This car can accommodate a private bar service and limited catering services. Our fully stocked concession car is accessible to passengers riding in this train car. 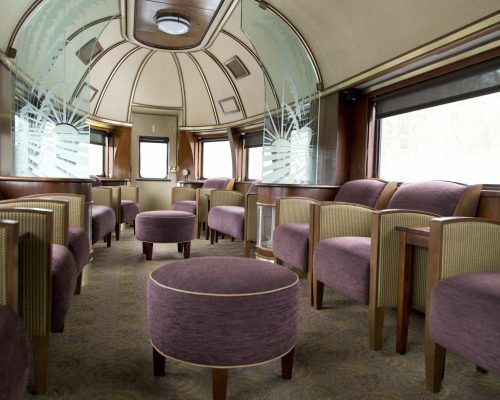 The recently renovated Executive First Class Car houses both our Upper Dome and Lounge. On the lower level, Lounge (12 seats) offers comfortable seating with additional leg room. Upstairs, the Dome section (24 seats) offers a panoramic view of the park. This car can accommodate a private bar service and can catering services. Our fully stocked concession car is accessible to passengers riding in this train car. 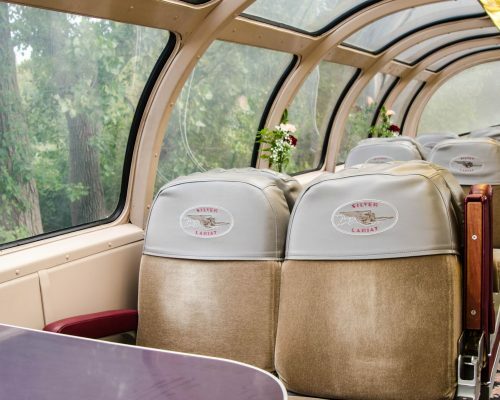 The Upper Dome is the upper level of the First-Class Car. The upper dome offers a unique view of the park under a glass enclosure that sits just above the train car. This car cannot accommodate a private bar service or catering services. Our fully stocked concession car is accessible to passengers riding in this train car. 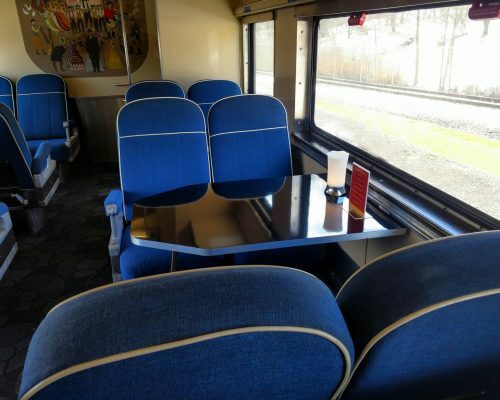 The table car can accommodate a private bar, and catering services. Seats are at dining tables in sections of four, with two seats facing two seats. A small kitchen is available on some standard table cars. Coach cars accommodate large parties, and offer traditional coach seats in sections of four, with two seats facing two seats. This car cannot accommodate a private bar or catering service. Our fully stocked concession car is made available to passengers riding in this train car. These options are priced in addition to the car rental fees. Outside food and beverages are not permitted on our train cars. Passengers select from a variety of sandwiches that come with pasta salad, non-alcoholic beverage and cookie. $320.00 for Light Appetizers, passengers choose from an assortment of two hot appetizers and two cold appetizers. $380.00 for Heavy Appetizers, passengers choose from an assortment of three hot appetizers and three cold appetizers. $15.00 per person, buffet style lunch includes garden salad with Italian dressing, fresh baked dinner rolls with butter, entrée, side, and dessert from our food service catering menu. Servers are available for an additional cost. $20.00 flat fee, allows passenger to bring on their own cake or cupcake. These options are priced in addition to the car rental fees. We strongly encourage to book no less than 6 weeks prior to the event. A 50% deposit, based on your car rental fees, is due 10 business days after making your reservation. Deposits are non-refundable and non-exchangeable. A signed contract is due 5 business days after making your reservation. Your event is not secured until both the contract and the deposit are received. Miscellaneous costs, such as food or beverage packages are due 10 business days prior to your event. Final Payment towards your remaining balance is due 10 business days prior to your trip.